Ugo Torre first appears in the Painesville, Ohio, area, about 1915. In America, Ugo Torre was known as Hugo Torre. Ugo Torre, son of Giuseppe Torre and Nunzia DiCarlo, was born on January 9, 1897, at Novara di Sicilia. He married Ethel Josephine Nenno, daughter of Charles Nenno and Nettie Stringer, on December 31, 1919, at Lake County, Ohio. Ugo died on November 30, 1975, at Lake County Memorial Hospital, Painesville, Lake County, Ohio, at age 78. His body was interred at Riverside Cemetery at Painesville, Lake County, Ohio. Ugo Torre, age 16, immigrated to the United States on October 25, 1913. He became a citizen of the United States on September 11, 1923. Ugo resided at 617 Third Street, Fairport Harbor, Lake County, Ohio, when he was Naturalized. 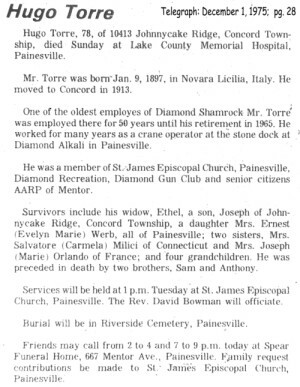 Ugo Torre’s brother, Salvatore Torre, also lived in Painesville. Salvatore migrated to Painesville in 1913. Mr. Torre was employed by the Diamond Alkali Company at Fairport Harbor from 1915 until he retired in 1965. He was one of the first employees of the Diamond Alkali Company. At the time of death, Ugo resided at 10413 Johnnycake Ridge, Concord Township, Lake County, Ohio. 1. Evelyn Marie Torre was born about 1921. She married Ernest Werb. 2. Joseph Torre was born about 1923, at Ohio.